What can abandon rate tell you about your call center’s staffing levels? Well, quite a lot in fact. Your phone system is brimming with powerful analytics about your call center’s performance—insights that can be directly translated into data-driven decisions that impact the bottom line. These detailed analytics remain primarily untapped by contact center managers. While identifying a manageable set of metrics to track over time is step one, understanding how to interpret and act upon that data is where the real challenge (and reward) comes in. 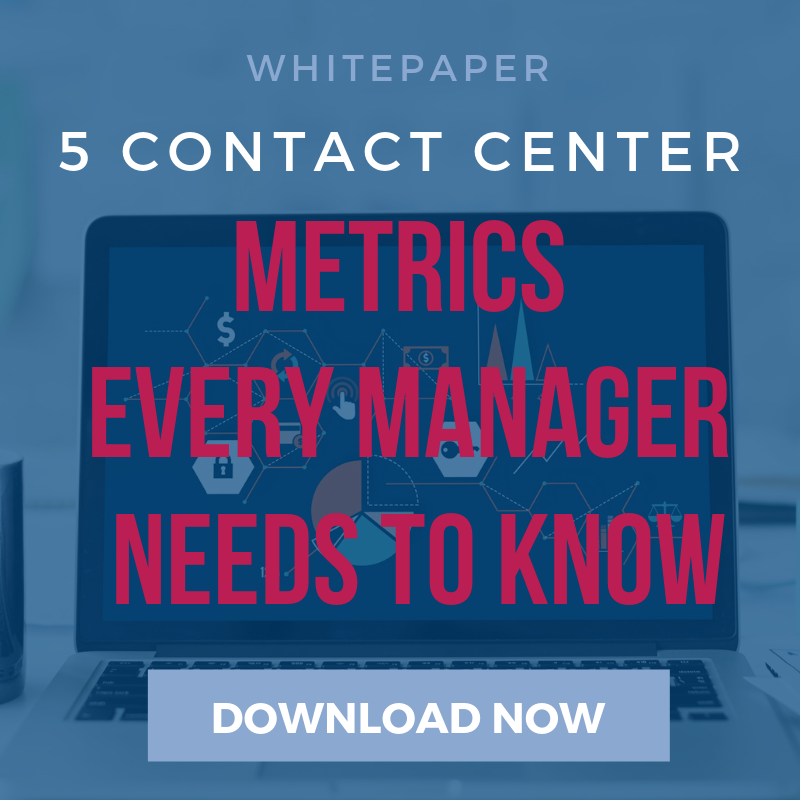 We’ve narrowed down five (5) of the most important call center KPI combinations to monitor and explain how managers can use them to make smarter decisions around training, call volume, and customer satisfaction. Let’s dive in. This metric is the percentage of calls in which the caller hangs up before the call is answered or routed. Across multiple industries, a healthy abandon rate is between 4% and 8%. Below 4% means you may be spending a lot of money on call center staffing without a commensurate increase in customer satisfaction. An abandon rate above 8% indicates that you likely have customer service issues. By watching this metric, you are simultaneously monitoring your staffing levels and measuring customer satisfaction while ensuring the highest ROI for your employee investment. First, let’s define these terms. Queue time for abandoned calls is the amount of time a caller waits before hanging up. Overall queue time is the amount of time calls spend queuing for any exit reason. Average staffing level is the average number of agents actively logged in. By measuring the queue time for abandoned calls and comparing it to the overall queue time for the group, managers can make judgments around staffing levels by testing whether customers are willing to wait slightly longer than the usual for an agent. The willingness by customers to wait a little longer in queue gives tremendous flexibility around staffing level planning. This is especially true when combined with an analytics platform that can tell you when and under what circumstances customers are willing to wait longer. This data enables managers to dynamically staff the call center with data to justify those decisions. Agent call handle time is the total time an agent spends on one call including talk time, hold time, and wrap time. The percentage of calls transferred refers to the number of calls the agent takes in a group and transfers on to someone else, divided by the total number of calls that the agent takes from the group in any time period. When you combine the average handle time of an agent with their percentage of calls transferred, you can glean some interesting insights around employee training needs. A high average handle time and a high percentage of transfers is often a sign that the agent needs additional training. The first metric refers to the percentage of time the agent is logged into the queue and able to take calls. The second metric refers to the percentage of calls the agent answered from the queue, out of the total number of calls that were presented to them. Both KPIs are useful to track individually, but in tandem, can add even more value. For example, a high percentage available (or low utilization percentage) and a small percentage of calls answered on a per agent basis can point to areas where agents need extra support. Conversely, a high percentage available and a high percentage of calls answered across the board (not on a per agent basis) is an indication of an over-staffed call center. A wrap-up code is the “reason” attributed to a particular call. Reasons could include password resets, VPN issues, or backup problems. It’s important to track these codes to understand how many of each type of call comes in. However, it could be more important to know how much time each type of call takes. For example: If in a week, that group receives 100 password reset calls that require a 5-minute response on average, versus the same group receiving 50 VPN issues that need a 30-minute response, it’s easier for managers to determine which types of issues could benefit more from an automated solution versus live agent support. With the right metrics from your call center, you and your team will have the data you need to manage your customer experience, get the most out of your call center employees and maximize the return on your investment.